It’s not every day that a full box of fruit arrives on your stoop. The Washington State Fruit Commission and their preserving-themed sister site, Sweet Preservation, made me a delicious offer a few weeks ago. I accepted the title of ‘2011 Canbassador’, which I share with my friend Cathy (and others?) and started stockpiling sugar and vinegar in preparation. I dove into all the possibilites the night of these lovelies’ arrival. Four days, quite a few cups of sugar, many, many dishes and a few minor melt-downs (remember I’m a super-small-batch girl, long hours that comprise back-to-back preserving recipes are not generally my style), and it was all so very worth it. I got to build the great castle of stonefruits jewels. All memory of hot, stirring and sticky was completely erased when faced with this red-hued statue of accomplishment. I’m grateful for the gratis fruit WA state shared with me because it allowed me to play with types of fruit that are not largely available in my Central Texas region. It allowed me more exposure to working with summer’s end stone fruits and to be able to develop and fine-tune recipes to share with you all across the country, some of you who might still be able to find these goodies at your farmers’ markets! I’m going to pass along only two of those five recipes right now because I’d like more time to work out the others, and that might mean waiting until next year when I have seasonal access to them again. 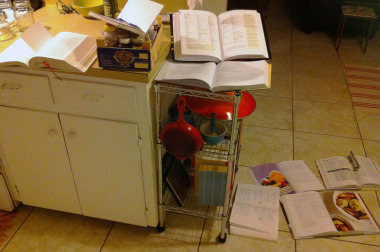 One of the recipes is headed straight to a future book’s manuscript folder, because it’s that delicious (and the way my publisher rolls, and many other publishers, too, is by requesting original recipes—ones that have not already appeared on my blog). Thank you for your understanding and patience with this. 1. Place 3 pint jars and a half-pint jar (or some combination equalling 3.5 pints, I used two pint jars and two 3/4-pint jars) in the canner pot and turn up the heat to high. 2. Make the syrup by combining 2 cups water and 1-1/3 cup sugar in a medium saucepan. Bring to a simmer and then remove pan from heat. 3. Prepare your fruit. Peel, pit and cut the 2lbs nectarines into approx 1/4” slices. Leaving skin on, halve and pit 1lb of prune plums. 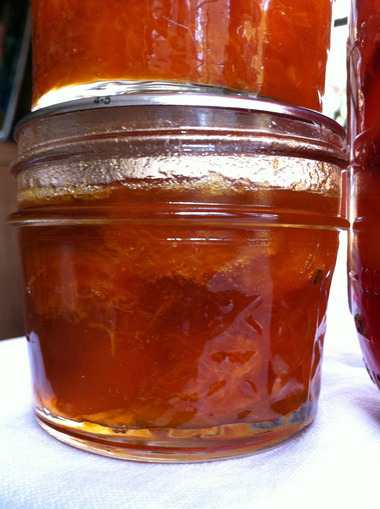 Place plums and nectarines in a clean bowl and prepare your jars. 4. Pull hot jars out of the canner pot. For spiced fruit, place 2 whole allspice berries in each jar and 1 cinnamon stick broken (as best as you can) into four pieces, one piece in each jar. Layer nectarines and plums into jars with (or without) spices. Pack the fruit in as tightly as you can. 5. Ladle syrup over fruit leaving 1” headspace, the space between the rim of the jar and the fruit bobbing in the liquid. Take a chopstick or a bubbler wand and remove excess air pockets from your jars. Top off any jars that need more syrup after bubbling. 6. Wipe any sticky, syrup spillage from jar rims with a dampened paper towel. Seal with two-piece lids and process for 20 minutes in your canner pot. 1. Start your canner pot and place 4 half-pint jars inside to get them nice and hot. Turn the heat on low to melt the sugar, and then increase to med-high until the syrup boils. Add the spice bag to your syrup. 4. Bring down the heat on your syrup once it boils to maintain a steady simmer (not rolling boil) and reduce your syrup while you prepare your nectarines. 5. You’ll need about 5 medium-sized nectarines to fit in four half-pint jars; this is slightly under 2lbs. Peel them according to the blanching method described in the recipe above. 6. Once peeled I sliced my nectarines into quarters and then halved each quarter. I chopped each slice then into sections about 1”-long and 1/2”-thick. Precision is not important here, but you don’t want your chunks to be too large or largely out of proportion with the rest of the pieces. Think about what you’re likely to do with them once they’re pickled and consider the size you’d find most useful. As you cut them up, place your nectarines pieces directly into your simmering syrup. 7. Raise heat to med-high when you have all your nectarines cut up and in the syrup. Boil for 5 minutes, reducing heat slightly if the bubbles are so poofy that you can’t even see your nectarines anymore. 8. Three removals: Remove jars from your already-boiling canner pot. Remove your preserving pan from heat. Remove the spice bag [carefully] from your boiled mixture. Then, with a slotted spoon, scoop nectarines into your hot jars and then ladle the syrup over the nectarines. Use a chopstick or proper bubbling wand to remove air pockets trapped inside your jars. Add more syrup to each jar so that there’s 3/4”-inch headspace. 9. Wipe rims free of any syrup spillage and seal with two piece lids. Process this size jar, with these sized chunks of nectarines for 15 minutes in your canner pot. The Sweet Preservation site is a great resource for answering or directing you to the pro’s for your canning safety questions. They also have tips on freezing fruit and free ways to fancy up your jars for gifting.